Anybody driving between Bengaluru and Mysuru, would speed past a sign reading "Welcome to the Silk City of Ramanagara" barely even noticing it. A small town with very few visitors, what looks like a forgotten place is in fact a mix of assorted sights. It was known as Shamserabad during the era of TipuSultan and Closepet during the British Raj era after Sir Barry Close. At present the place is known as the Silk City, and is a major source of Mysore silk and is one of the largest silk cocoon markets in all of Asia. Besides learning more about the silk industry there is a lot more to do for a visitor to do in Ramanagara. On your way into the town, you can grab a breakfast of thatte idllis at one of the many eateries across the highway and also have the mouthwatering 'Mysore pak' at Hotel Sri Janardhan. The town enjoys a pleasant and tropical weather throughout the year and hence can be visited at any point of time, throughout the year. By Air: The nearest airport is the Kempegowda international airport in Bengaluru which is around 90 km. The airport is well-connected to all the major towns and cities across the country and to a few abroad. By Train: The Ramanagara Station is well-connected to all the major towns and cities across the state of Karnataka and to other major cities across the country. By Road: Ramanagara is located approximately at a distance of 50 km from Bengaluru in the south west direction. There are plenty of buses which ply regularly from Bengaluru and Mysuru as the place falls enroute to Mysuru from Bengaluru and vice versa. The Vulture sanctuary is home to about 20 species of these critically endangered birds. It at times tends to be a difficult task to stop them as they camouflage with perfectly in the hilly terrain. The sanctuary was established in 2012 to protect these species after their was significant population drop after feeding on drug injected carcasses of cattle. One can also spot yellow-throated bulbuls, sloth bears and a variety of birds. Trekkers and rock climbers come here to get their hands dirty on the world's oldest granite formations. There is no rock climbing during the monsoon season as the rocks tend to get slippery. The landscape has also been the location in many movies such Sholay, A Passage to India and many more. Ramanagara is synonymous to sericulture, with the government owned silk cocoon market located at the center of the town, and is always bustling with activities. 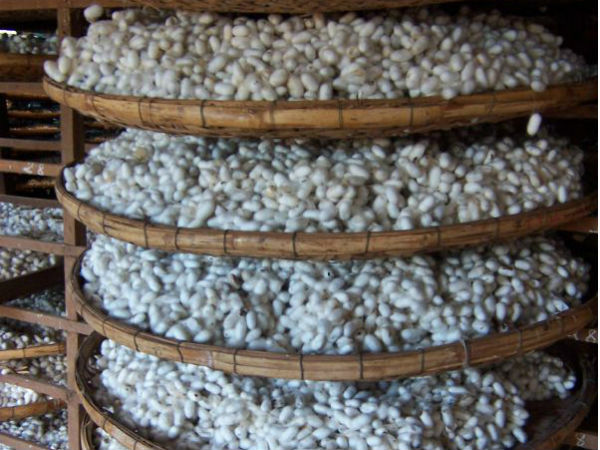 Almost 50 tonnes of cocoons are sold every single day. The government has elaborate monitoring systems to make sure that the sericulture farmers get the deserved rates. Away from the centre into the bylines you would come across many small scale manufacturingcentres where the cocoons are processed and silk long fibres are extracted and world famous Mysore silk sarees are woven. The folk arts museum throws light on the rural culture of Karnataka. The museum has over 5,000 artifacts which are related to cooking, farming, stoves, animal traps and many more. The notable amongst them are the puppets, masks and dolls of traditional dance and art forms like Yakshagana which showcases the rich cultural history. An interesting factor here is that the guides are not only well knowledgeable but are well-known folk artists themselves.